‘Seriously talented.’ My initial impression when meeting Nate Walsh for the first time several years ago at Sunset Hills Vineyard in Loudoun County. Nate has worked in the Willamette Valley region of Oregon and in the Central Otago region of New Zealand. He’s been part of the Virginia wine scene since 2004, working in the Shenandoah Valley, the Monticello region and in Loudoun County. In 2014, he founded Walsh Family Wine along with his wife Sarah (who is a legit wine geek! ), based on Loudoun County. 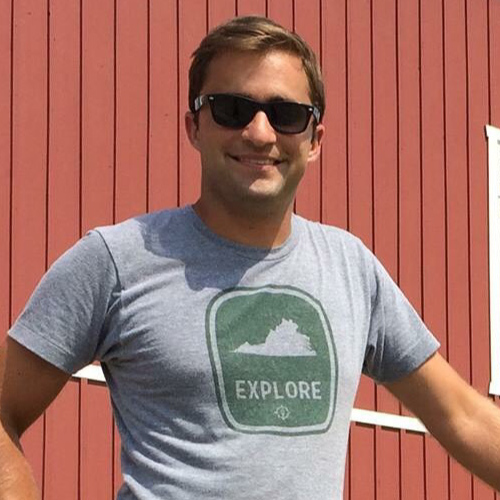 Nate is father, husband, and current president of the Virginia Vineyards Association. You have worked in several regions, why did you choose Virginia for your wine home? Virginia is exciting to me because, first and foremost, there are some quite wonderful vineyards sites peppered throughout the state. Some have been planted, most have not. So, there is an opportunity to establish these sites as producers of high quality wine from a burgeoning but still relatively unknown region, and thus elevate the wines from the region overall. We’ve learned a lot, but we still have a nice long trek ahead of us. I like the promise, and the unknown, and the challenge. Virginia is a beautiful place. Walsh Family Wine produces vineyard-specific wines – currently these are varietal wines from our sites in Loudoun County: Bethany Ridge and Twin Notch. In the future, once the sites are more mature, we will likely shift to blends, both red and white – the goal being to show to the wine drinking community and ourselves what it is that is so special about the sites, and to create a vineyard-based style. I like texture and finesse, most of all, and I think that shows through in the wines that we produce. Mentoring is important to navigating the wine (and life) learning curve; what role have mentors (and who) played in your winemaking career so far? I did not formally study winemaking – my learning has been through the winemaking community and through private study, and to some degree simply on the job training. I was lucky to begin working beneath Mike Heny, a Virginia winemaker, who I worked under for four years and whose style and approach and work ethic made a large impact on me. By the time you print this I will have just finished Cloud Atlas, by David Mitchell.